The last musical that I attended was Magical Musical Gala Premiere at Amphitheatre, Sunway Lagoon. I enjoyed it very much. It was magical to me. Well, this month the magical land of Askabar is coming to Sunway Lagoon again in the latest production, Aladdin The Musical. The opening night for this West End Production is set for November 25th in a Gala Premiere, which will include special stage effects, signature to the Amphitheatre @ Sunway Lagoon. Aladdin The Musical tells the favourite tale of a boy’s magical adventure from street rat to Prince, when he is discovered to be ‘a diamond in the rough’ by Jafar, the evil aide to the bubbly and lovable Sultan. With the help of a magic lamp and a jovial ‘rapping’ Genie, Aladdin wrestles against the odds to win the heart of Princess Jasmine while he ingeniously uses good to triumph over evil. “Following the immense success of our earlier productions, Peter Pan The Musical and Magical Musicals, we have decided take our stage production expertise to the next level with Aladdin The Musical. We are very excited for this upcoming production because of the ‘magical’ quality to this age-old tale. From flying carpets, pyrotechnics, snow to other aerial performances, our production team will be bringing the magic of Aladdin to life,” said Aaron Soo, Chief Executive Officer of Sunway Lagoon. This extravagant West End production at the Amphitheatre @ Sunway Lagoon will add a modern, musical twist to its stage play. Integrating contemporary pop music with the classic storyline, Aladdin The Musical is a production that all walks of life will enjoy. “Aladdin The Musical @ Sunway Lagoon has a lot of comedic elements which make for a wonderful year-end show for the entire family. Although the story is set in the fictional, ancient city of Askabar, the audience can be sure that they will stay entertained with a lively performance, filled with catchy music and great humour,” said Chris Colby, Director of Aladdin The Musical. Joining Chris Colby in this production is David Kort, Choreographer of Aladdin The Musical. “Choreographing for Aladdin The Musical is such a different experience from the previous musicals here at Sunway Lagoon. This time around, we will have a moving set, which evolves with the storyline. This makes for an intense experience not only for the audience but the performers themselves. This production is going to be unlike anything that you have seen in Malaysia and even, at Sunway Lagoon,” said Kort. 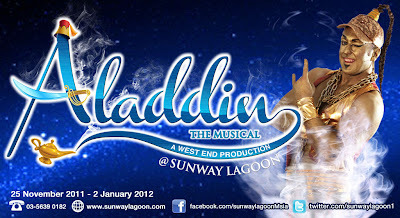 Aladdin The Musical will be playing at the Amphitheatre @ Sunway Lagoon from November 25th, 2011 until January 2nd 2012. The musical will show once a day, from Sunday to Friday at 8:00pm (no show on Tuesdays), and twice on Saturdays at 7:15pm and 9:15pm with extra shows on 25th December 2011 (Sunday) and 1st January 2012 (Sunday) at 7:15pm and 9:15pm. Ticket prices range from RM300, RM250, RM200 and RM100 for adults and RM150, RM120, RM100, and RM50 for children up to 12 years old.